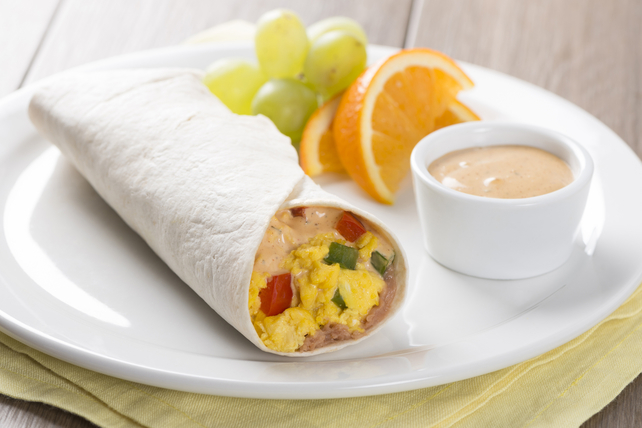 These delicious Southwest-inspired burritos can be eaten at home or on the go. Heat oil in large skillet on medium-high heat. Add vegetables; cook 3 min. or until softened, stirring frequently. Meanwhile, whisk eggs and cheese until blended. Pour egg mixture over vegetables; cook 3 to 4 min. or until set, stirring occasionally. Remove from heat. Spread tortillas with beans. Spoon egg mixture down centres of tortillas; drizzle with dressing. Fold in opposite sides of each tortilla, then roll up burrito style. Serve with fresh fruit, such as grapes and orange slices.